Submit retail listings to Google Base. Submit your business in a local search index. AJAX and content management systems are great for users; not so much for spiders. Avoid building barriers to indexability. Is your content hidden behind a form? If so, consider cloaking for spiders. Take advantage of PR. Stacie Ito said AT&T generates a pressie for every device launched. Each product has its own page with detailed info, proper metadata, adequately tagged imagery (so people know what they are), titles and links. Something Ito said that nobody else would admit: you DO NOT need to be relevant to a keyword to rank well on Google. One of the top results for "iPhone" is a promotional video for BlendTec. All they did was put an iPhone into a blender to see if it would blend. D'Souza looked put-off by the blender story. I laughed. "Universal" search results include pictures, maps, book reviews and video, which typically appear at organic location four -- just above the fold -- and locations nine or 10. The best way to serve a searcher's needs is not necessarily always serving what the Google Algo thinks is most appropriate. If what they queried recently made headlines, a Google News story may appear atop the results. If "pictures" is added to the query, Google "knows" to be more generous with image inclusion. "We increasingly found that even if people were on Google, they would put a street address into the search box, even though they weren't on Google Maps," said D'Souza. Google decided people shouldn't have to keep a checklist of where to go for different information. D'Souza also defended the reason YouTube videos are almost always used as the top video in a search. He took jabs on this throughout the panel from audience members and even fellow panelists, particularly Macaitis. There is no favoritism, D'Souza insisted. Google picks the most relevant video. "But if you're a small site, your ability to accommodate the bandwidth could be a factor." Over time, personal bias shall rule the day, even in search. A search for "java" could potentially generate programming, coffee or travel results. Depending on who you are, behavioral search will give you what it thinks you're most likely looking for. Phorm, which works directly with ISPs, is working on advertising that incorporates across-the-'net habits, and that can appear on any participating website. This means if you are a participating website, you don't have to generate lots of traffic just to get an advertiser to look in your direction. The person who visits will determine the ad you serve. And if click-thru happens, you get a cut for providing the real estate. But behavioral terracing isn't all about search habits; it can also be geographical. A UK-based user seeking banking assistance may get results for Barclays, while a US-based one may see Bank of America. Community is smiled-upon by Google. Take advantage of video and (properly tagged) imagery. Incorporate reviews, forums, tutorials and tech chat if you can. Get over ranking reports. Clay calls this "behavioral bias." In the future, how well you rank on a keyword won't help much, as query results change based on who the user is. "The longtail consequence you can never measure from a ranking report anyhow. Your rankings can hold steady and your traffic can go up 50 percent. You're still a winner." It is possible to change the URL for your site -- updating from HTML to PHP, for example -- without losing Google cred. Create a 301 redirect from each old URL to its corresponding new one. This tells Google your page was moved. Over time, it will transfer your site rep.
Clay advises expediting this process with a site map. "Helps Google find the 301s about three times faster." DO NOT use a 302 redirect instead. There was a big explanation about why you shouldn't use them, but to make a long story short, they confuse Google. Consider cloaking. This grey hat tactic was tut-tutted by audience members (D'Souza said nothing, but he did look constipated). Clay insists there are proper uses for it: Bacardi, for example, cloaks so engines can freely view pages that are normally blocked to users under 21. There are plenty of legit reasons for duplicate content. "PRs published on many sites, for example. The one that gets the most links will probably win in the end," said Macaitis. Part of indexing is figuring out what is legitimately duplicate and abusively duplicate. This is why creating 301s is important if you move your site to a new URL. You will not run into duplicate content issues if someone comes to your site via www.yoursitehere.com and someone else comes to your site from http://yoursitehere.com. D'Souza: "Typically we realize that's the exact same page because the content should be identical. We'll pick up the www version." D'Souza: "Diversity is something Google cares about in search results. We definitely don't like to have the exact same content in 4 or 5 results." Google makes an effort to reflect just one copy of something that has been duplicated across the web. It uses the page with the strongest site reputation or most linkbacks. This is more difficult with video/images and other richer media. Context helps, but not completely. Says Clay: You can have the same content on multiple domains or locations within your domain. The search engine will pick the most authoritative page and filter the rest. This isn't considered a reason to penalize you. Don't hide text. 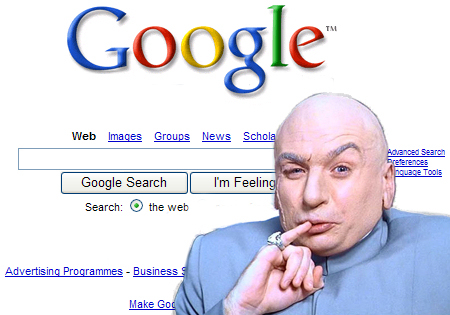 Google considers it malicious because there's no way users can read or interact with it. Avoid wordsmithing! When you repurpose content and make a trivial change -- as if you want to fool Google into thinking the content isn't the same -- that's considered spamming. How often do your listings get clicked on? (Write a good description tag.) How quickly do they typically bounce off? How long has the URL existed? Is there an absence of clicks when your site appears for a given keyword? "Absence of clicks can suggest there's something wrong with a search result," D'Souza says. Well, I wish I'd been there to hear the entire justification for cloaking, since the official Google webmaster guidelines specifically poo-poo that practice. Other than that... I must say, good write-up, Angela! Bruce Clay in defense of cloaking: "Guns don't kill people, people kill people!" But... but... Does that make sense? Bad SEO kills more people than guns, I really do think. At least in California. Great article, really helpful. Will cite this!